Here is one of my today's efforts - you wouldn't think I had knitted up a ball of wool in a cable pattern whilst watching the rugby on Saturday, would you? Then when it hits the embellisher, all is changed forever. Don't throw out any old jerseys from now on. Bruce and Kazuko are back from Japan and Grant is sailing in the 18ft skiffs champs in south of France. Some people have all the luck. 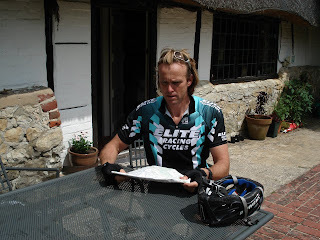 He has given us a job - something about cleaning the windows in his house (thoroughly) and applying a surface. here are the details of the workshops/presentations. 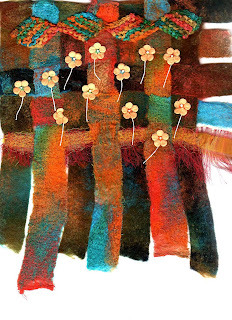 The colourful, contemporary textile art of Helen Cowans reflects a love of many hand and machine embroidery techniques, mainly inspired by science, landscape and eastern cultures and includes a range of items from 3D structures to large wall hangings. Come and meet Helen and learn how she came to have such a passion for textiles, her early work and inspirations, including studies and art relating to Biology. Sarah's fabulous concept of making lady shaped art brooches to keep or give away is beautifully explained in her very popular new book "Wild Woman - Stitch Art Brooches " You just create the Basic shape with a variety of media, then give each one a personality with a variety of gorgeous embellishments. Come and play with Lutradur, Gossamer Fuse, Moonshadow Mists and more on papers and fabrics. Layer, bond and burn – no time for stitch. You will come away with a very individual little house book and lots of ideas for playing at home. In this fascinating presentation Helen will look at work influenced by the Gothic Revival Art of Pugin along with India and the Islamic world. Knitting with natural materials is always a pleasurable activity, let alone the luxury of the knitted outcome. However, when knitted textiles are combined with the particular properties given by silk fibres, we enter a whole new realm of constructed surface. 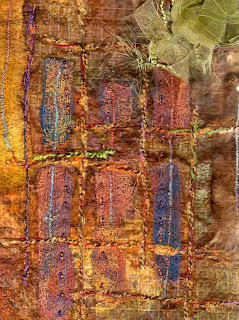 Workshop gives technique and sampling outcomes for the more adventurous textile artist. PS No knitting involved. You can, of course, book with us by email or phone for my and Sarah's hands-on any time before the show. We will both have limited numbers for hands-on. Helen is also giving a 2 day workshop 5th and 6th August after the show and Sarah on 29th July before the show - the info for these will be on our website soon. 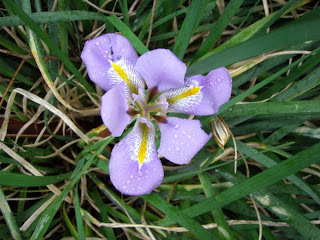 This is one of the wild irises growing on what we call the Barbara bush - it has loads of little irises which sometimes I draw - Barbara used to like sleeping in this little bush outside our back door and this is where she lay for her final sleep and we thought in the morning she was taking a long time to get up for breakfast. I love Irises and bought a big bunch today when I went for my walk to lug groceries back for dinner tonight - chicken curry - see I do cook. Here is the beautiful Barbara in her heyday. 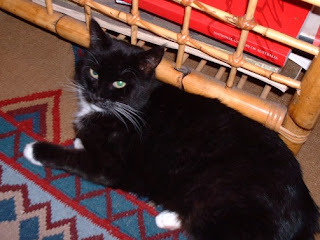 We have a little black cat which comes to visit us during the day - I caught it sneaking into our bedroom. Just as well Kazuko isn't here or she would feed it. Its owner must be at work during the day and we look like a good bet. It was helping Ian cut the fusible film the other day. Talking of which I am doing a little experimenting and if it works I will post a pic tomorrow. Today I am embellishing and heat gunning for lesson 5. no more knitting I promise although I am doing a bit of that today. Off to see if Robbie's Wallabies can beat the French. 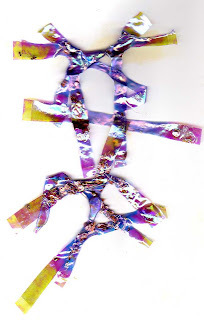 I have been playing around a bit with the Angelina fusible film - doesn't scan that well but if you trap metallic flakes between 2 layers and iron them together you get some very interesting results. I have been cutting into the sheets with a soldering iron, heat gunning them and making beads. And cutting into strips and recreating. 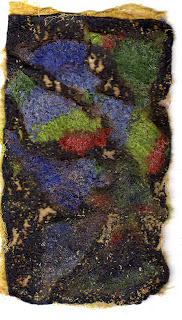 At the Quilt Craft and Stitch show in Perth 1-3 August I am running a hands-on workshop - Ratty Tatty Papers where we will play with things like the fusible film and Lutradur and Moonshadow Mists and Walnut Ink and all that stuff. I am working on a new on-line workshop for the new year - must be silly I suppose but it keeps me out of mischief. Not being a cricket lover I nearly missed the incident in England where the Kiwis won on death's knoll but the incident has brought back memories of the underarm bowling - the only time that whenever we opened our mouths and spoke, we got an apology! This on-line embellisher course is keeping me on my toes. Today I was supposed to tidy the studio but it will have to be tomorrow. Have been admiring all the Flimsies which I have been rolling and various other things all of which needed to be done. I had a bit of fun yesterday when I was finishing off lesson 4 - they have to knit which has caused a bit of chaos but I have been doing it for a long time and it seems that knitting works in so well with the embellisher - you can texture it and distress it (won't tell you how - that would give it away) but I decided to use up a few of my scraps while clearing the area on which to work and I whipped up this little fun piece. You could use this sort of idea for cards - very quick and easy. Much faster than a sewing machine. I found this one on my stash as well - a Qantas Club hand towel - I have a little pile - you can't really embellish directly onto it but fibrous things on top work very well - there's scrim and wool fibres and silk pods on this one. 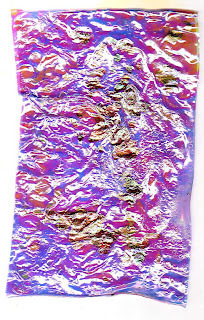 I have also been experimenting with the Angelina fusible film - trapping metallic flakes inside - - I will show some tomorrow if it photographs well. And I don't usually blow my own trumpet but Judy from Ontario said this about me and it really tickled my fancy. She is one of the happy campers enrolled in the class. I am sure enjoying all the great work that is showing up everyday. It is hard to keep up with it all. There is sure lots of scope for experimentation and extension. Of course that is what Dale is noted for in all her courses. She just opens the lid and everything jumps out into your brain. I am working away on the online workshop - a bit of knitting to add in. Knitting came back in with a whoosh and I guess it is still going strong. I was born with a pair of knitting needles in my hands and my Grandmother and mother were always knitting. These days I like to knit small pieces to work in with other textiley stuff and mostly the embellisher loves to embody it in. This is a little play on the Kimberley Dreaming theme - I have a pile of different flower bits and pieces in my ephemera collection. I have been working with KD slushie and flimsie. The All Blacks had a very good win last night and NZ even won the cricket so that must be 2 up on England. Not that I watch the cricket - too boring for me. The Little Mexican restaurant on Friday - well I wouldn't recommend it - Eva booked on Tuesday for Friday but they were obviously greedy and had double booked - tried to fudge us with a table out the back by the toilets and raved on about putting on a cd for ambience. So we left and went to another where the staff were lovely but the food not worth a visit. Good friends, good company so that saved the night. 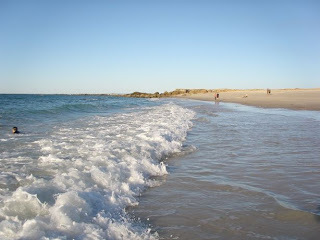 It's a beautiful day today in Perth - really should be in the garden cleaning and preparing for spring. Each week rolls along so fast. 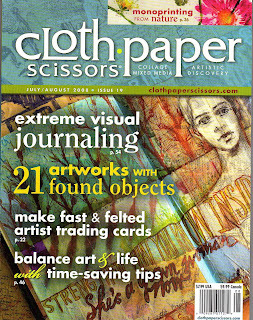 Cloth Paper Scissors Issue 19 arrived about 4pm today - no time to get them all out - only a few but the remainder will go out on Monday. This time the printer had valued the shipment a little higher - $60 - fortunately Customs let them in straight away this time. It looks like an interesting issue. 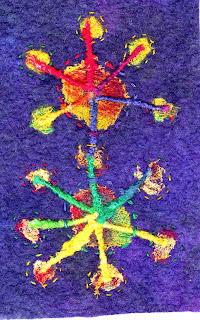 There is an article on needle-felting ATCs both by hand and by machine and it got me thinking that it would be good to have an exhibition of embellisher made journal art-type pieces. What do you think? There is so much fabulous work going on in my on-line workshop that it would be very much appreciated. I could approach the organisers of Australian Quilt Conference for Feb and also Knitting and Stitching at Alexandra Palace in October 2009. There is so much fabulous work being created that it should be seen and loved by others especially when there is plenty of truly awful stuff out there as well. Not a lot of creative stuff has been done here unless you count cutting (Ian's job), and packaging (my job) of Angelina Fusible Film. Even Ian thinks it looks very attractive even if he doesn't know (want to know) what to do with it. He is stil getting to that promotion on the website though. Tonight we are off to a Mexican restaurant with Eva and Malachy. 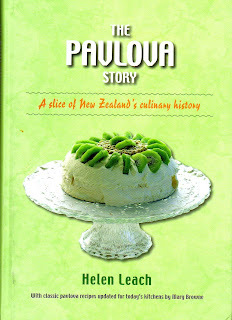 Happy Birthday Sarina - I was so busy with my new pav book yesterday that I forgot to post a birthday greeting to you way over there in Cairns. Anyway this way you get an extra day's birthday I reckon! We have decided to bring in Angelina Fusible Film because lots of shops have asked us and we want to be able to sell it at a better price and the first 6 colours arrived today - the film is on large rolls just designed for me to cut into 3 metre lengths! Another stack-up in the kitchen. Check the promotions on our website as Ian is planning to offer a good intro price knowing how much I will love to cut and package. We have decided to only offer our monthly specials in the newsletter - you have to sign up for that - mainly because he keeps getting behind - but we will use the website section for promotions. You have to sign up for the newsletter. no pics today.... but boy you should see the wonderful work the Embellish Stitch Enrich class are producing. They are certainly keeping me on my toes. 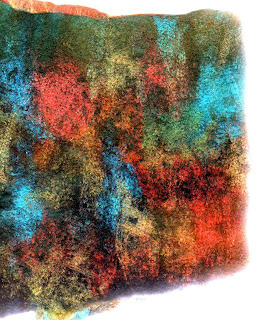 I have embellished KD slushies onto the batt and you get the most wonderful colourings - very very soft. Louise was wearing a scarf she had wet felted with a slushie when she called in last week - it is so soft - almost in competition with possum fur. It would be very light and very warm. I must try one in watersoluble as well. 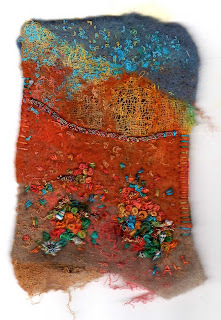 My next Embellish Stitch Enrich online workshop starts on 12th August. Woke up today to real rain dropping down - just like the west coast of NZ - nice to stay in bed all cuddled in. Great rugby last night - the ABs and the Rollabies both won their games. 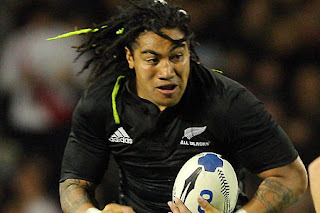 This is Nonu - he had a good game. Yesterday I went for a visit to Designing Women - some great work in their show and tell. THey are having an exhibition at Atwell House later on in the year. Spent most of today working on lesson 3 for my embellisher class - trying out a few new ideas. They are posting some fabulous work. Keeping me on my toes. Tonight we are off to Luigi and Martien's or maybe Spaghi but I do have tomorrow night's meal cooking away - oxtail - but it needs to sit overnight. I have just finished gathering the final order so I have no back log - Ian has 6 to invoice. All clear for the weekend. Just as well we didn't go to Sydney - how far behind would we be. Anyway plenty of people have been and not found us and phoned with orders. We snuck off to Lincolns for coffee with Frank and of course people phoned and came around. Can never win. Lots of ordering this week and lots of new goodies - thr3fold journal no 3 arrived today and it is extremely good like 1 and 2. And I collected the Tee Juice pens fat and thin - had a little play - very easy and convenient to use. Also the I-Dye - things are indeed getting easier. Busy rugby weekend - All Blacks/England and Wallabies/Ireland. Let's see how Aussie Robbie goes with his new charges. 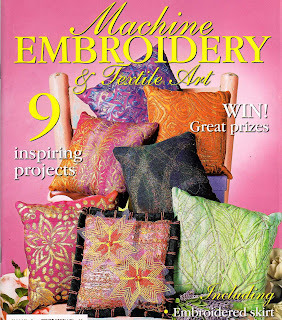 Got the latest edition of Machine Embroidery (and Textile Art) yesterday with my article on Shiva (Markal) stiks in it. Yvonne has put me on the front cover which is very nice. Ruth Issett introduced me to paintstiks way back in 1994/5 and they were one of the first products we sold at The Thread Studio. I have been promoting them for a long (and using them - never travel without a gold stik in your handbag). Good to see they are still on the big go. Ruth demonstrates them at Ally Pally and her first book was a little bible on using them. Shelly Stokes has taken up the baton in US and we are still selling them in a big way even with other people copying us. They are fabulous to use and I am hoping to have some new stencils coming soon - I have just tracked down some very interesting ones. A little bird tells me that Ruth may have a new book coming out with further excitements including paintstiks. The Inkaid which Maggie raves about in her book has arrived and I have been coating my papers in readiness for a printing moment. Since the first shipment has almost sold out I will have to order in some more. ACO concert was good albeit it a couple of very modern pieces we were not sure about - finished with a very nice Sibelius. Quite a few people left before it which was a shame as they missed out. Pay your money and stay to the end - it doesn't really matter what they play it is always wonderful and I guess it really is good for us to hear Stockhausen type music even if we don't lke it. Some music we hated way back we have learned to like. 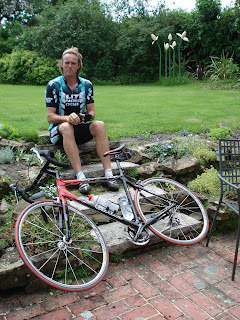 Here is Grant in Sutton visiting Annette so I know it is summer in the south of England. Just as well we are not in Sydney at Darling Harbour - we are still doggedly working through our orders and tonight we are off to an ACO concert - not sure what is on the programme as yet. And I am off to the studio through the lovely rain to get onto my next embellisher stuff. I found this gem when I was sorting through some photos. 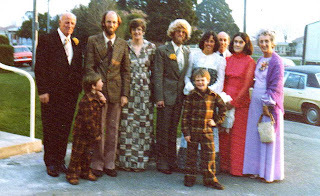 Here we are all ready to go to Raylene and Ken's wedding in 1976. Did we all dress that badly back then? The boys still complain about the woollen suits I made them - my caftan even has a hood and Ian's tweed jacket has been put to great fancy dress use over the years along with his bell bottoms. We had a nice weekend in Sydney and came home to rain - lots of it - lovely stuff. Watched the All Blacks win against Ireland in Wellington in the most atrocious conditions. I do recall in the past landing and taking off from Wellington airport - more like a helicopter going directly up - that was in the days when they gave you a glass (yes a glass) full of orange juice before you took off and the attempts not to spill meant drink fast. The on-line embellisher workshop people have been producing some lovely work - just putting the finishing touches to the second lesson here. We are in Sydney for the Quilt Market = this is a weekend trade show for retail only - we wholesale some things and looking to grow this area. It is not an afront to you Fibre Flora! it's part of our growth. The Darling Harbour show we simply decided we are too busy to do it this year - it takes heaps of work and then we get so far behind with our orders and stuff and we know we will miss seeing all of our lovely customers. And anyway if we did it I wouldn't have this lovely group of people doing my embellish stitch enrich workshop , would I? I am learning how to use my eee pc - the tiny keyboard and different operations. Before the next trip we need to practise loading pics from the digital camera and then we really will b cooking with gas. Today we are off again - to Sydney this time - no - not for the Darling Harbour show but for the Quilt trade show at Rosehill - Be back on Sunday night. This is one reason why we have been so very busy getting the workshop lessons done and the newsletter out and the Quilting Arts and all the other orders off to their new homes. Have spent time looking for the umbrellas as I think it is wet in Sydney. Friday night we are off to Saafran - our favourite Indian restaurant - the chef and GoGo trained together in Bombay. This is a lovely piece I bought from Djanne - Teapots - it reminds me of Marrakech. 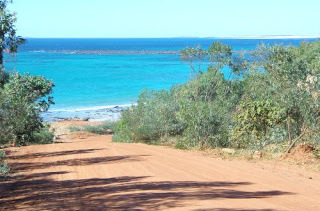 Cape Leveque is about 220 k north of Broome and we hired a 4WD as it is not considered suitable for cars and caravans. This is a new experience for us and when Ian has his photos developed you will be able to see us in the machine. We don't approve of them in town but out in the red dirt is something else. 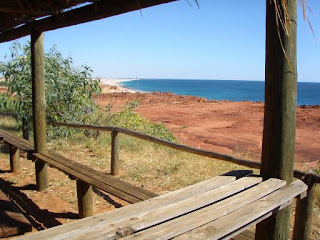 We bought our meat from Perth and our other supplies in Broome to take up to Kooljaman with us. We had a safari tent which is a very fancy tent on a wooden floor under another cover with a real bed - very comfortable - and a balcony - very nice and a kitchen. 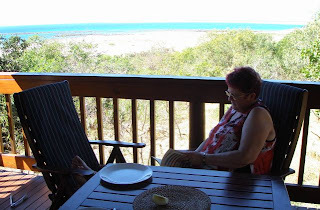 We had a great view of the sea and surrounds and lots of birds to greet us in the mornings. Lots of stars to see at night too without the city lights. This is the road down to the sea. Now we have forgotten we went away - the latest Quilting Arts has finally arrived. I would like to meet the printer/publisher who undervalues them at $4.20 for the entire shipment and excites Australian customs so that they hold them for a couple of weeks. We are back - had a wonderful time - tell you all about it soon. Off to work now - lots to catch up on. Nobody in town this weekend gone - Kazuko has gone to Japan - Bruce went cycling in Kalgoorlie and we, of course, had flown off to the blue and orange.